A buddy from Texas introduced me to these this weekend and I was immediately hooked. I had to see what I could come up with as a fairly healthy recipe for them so I did what I usually do and scoured recipes on the internet and then built my own version with suggestions or ideas from all the others I found. 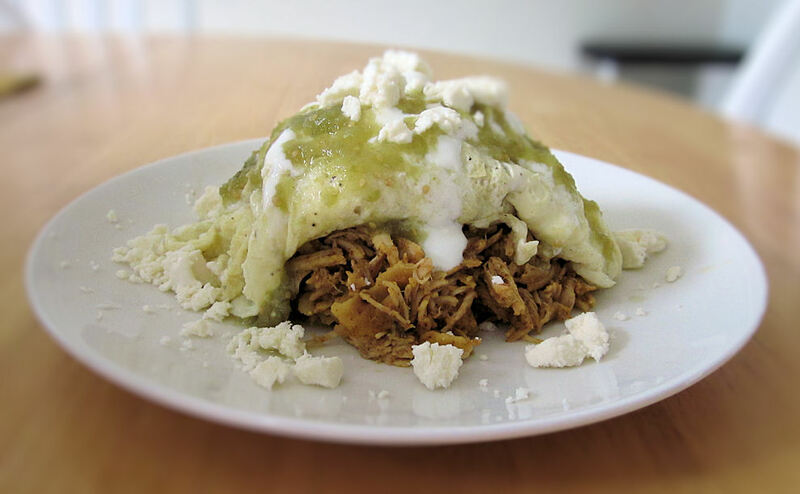 Pronounce chil-a-KEE-less and Spanish for “friggin’ delicious” there are a lot of variations to be found – con pollo, con carne, verde, rojo, etc. Since the ones I tried were chicken with green salsa that’s what I tried to recreate. I don’t claim my recipe is anywhere near authentic, but it is good. If you’re watching your sodium you might want to tweak this one some, there’s a lot of salt in the taco seasoning. This is awesome for breakfast or brunch, serve them with a sides of beans and you’re set. You can add a salad and you’ve got a great, healthy dinner. If you try this recipe please let me know what you think, if you have any suggestions for tweaks or variations please feel free to share those as well. Coat chicken breast on both sides with ½ of taco seasoning mix. Heat a large pan on medium high and spray with non-stick spray. Add chicken breasts and brown on each side. Add chicken stock to pan and remainder of taco seasoning and the diced onion. Turn heat to low and cover pan. Chicken will need to cook slowly for 2-3 hours, check it frequently and break into pieces as it cooks, when done chicken should shred easily, add more liquid (water will suffice) as needed to keep chicken moist. When chicken is almost done cut the corn tortillas into 1” wide strips. Pan fry or bake the strips to crisp them, use a little oil if necessary. Once tortillas are done add them to the shredded chicken and cook for 2-3 minutes until tortillas become soft but not mushy. Before adding the tortillas their should be a small amount of liquid to be absorbed, once cooked with the tortillas the mixture should be moist with no visible liquid. Mix eggs and egg whites in a bowl with about 2 Tbsp of water, salt and pepper. The combination of eggs and whites gives you the flavor of whole eggs but cuts down on calories and cholesterol, of course you can use all whites if you like. If possible get fresh eggs from a local farmers’ market as they have a more rich egg flavor. Thanks to my buddy Stan for this tip. Scramble eggs in a pan taking care not to overcook them. Plate ¼ of the chicken mixture and top with ¼ of the scrambled eggs. Pour 1 Tbsp crema over eggs and crumble 1 oz of the queso fresco over that, top that with 1-2 Tbsp of salsa verde. Chilaquiles are excellent served with black beans or refried beans. Great for any meal, especially Sunday brunch. Add a small side salad for a delicious and healthy dinner. You can use tortilla chips in this recipe and save the steps of cutting and cooking the tortillas. Mission sells tortilla strips that would be perfect for this. Buy a pre-cooked rotisserie chicken and shred it then add the taco seasoning and stock and cook down. Get plain rotisserie flavor or mojo if available. As mentioned above you can use sour cream thinned with milk to a heavy but pourable consistency if you can’t find Mexican crema or simply choose not to use it.